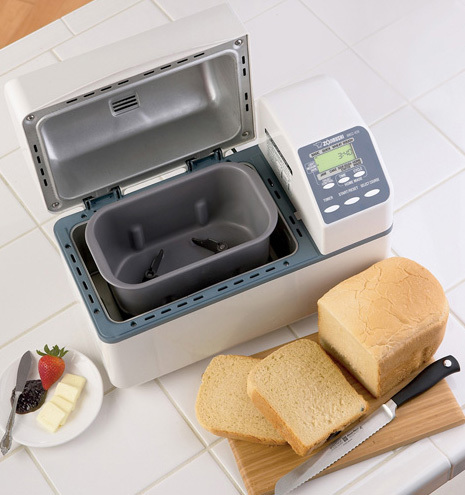 Q&A: What kind of bread machine do you have? If there’s one tool in my kitchen I would never want to be without, it’s my bread machine. My aunt and uncle got me one as a wedding gift and I used it so much it finally was giving out. Just around the time it was starting to breathe its last breath, my dad surprised me with a for Christmas. Let me tell you, this bread machine is the king of bread machines! It’s high-tech and offers quite a few different options — including the dough cycle that I mostly. It’s also roomy, so you can make larger loaves and bigger batches of dough. My favorite thing about the is that it has two kneading paddles. This creates a much better and softer texture in the dough which translates to softer, better-shaped bread and rolls. I rarely ever bake bread in my machine, because I’ve found that the crust is much softer when I bake the bread in the oven. It does mean that you have to be home and remember to take the dough out of the machine and bake it when it’s done, but it’s still so much easier than making bread completely from scratch. I can stick all the ingredients in the bread machine for Bread Machine Buttery Rolls and and hour and a half later, the dough is ready to be shaped into rolls. No mixing, no kneading and no worrying about setting a timer. Truly, in about ten minutes of total prep time, I can have a hot and fresh batch of rolls made. Do you have a bread machine? If so, what kind & do you like it? Looking for more? Read more posts about Q&A Tuesday. « Cents of Style: Buy One, Get One Free Statement Necklaces = 2 Necklaces for $17.95! Crystal, how long do you bake the dough in the oven? What temperature? A friend bought one for me at the thrift store. She says they are there regularly. If you bake gluten free bread, use the quick bread cycle. Bread machines are there often. Probably not the machine Crystal is talking about. I found my zojirushi at a thrift store. Best $10 ever spent there! Way to thrift! Jilbert….you rock. We have a Zoji and love it, too! It runs daily if not twice or three times a day. Crystal have you tried banana bread in your Zoji yet? Yummy! 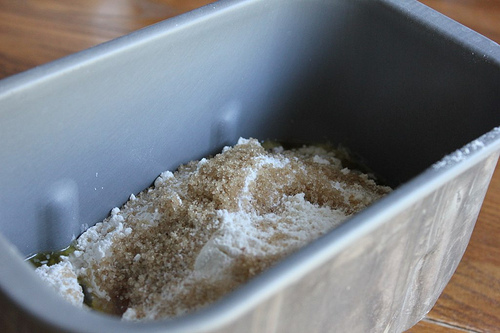 Julie C ~ would you be willing to post your banana bread recipe that you use in the bread machine? It does sound yummy. Has anyone made gluten free bread in this machine? Yes I have one and made a gluten free loaf last week. I used the feature of programming your own cycles. I looked online at some gluten free blogs and used their settings to program mine. The bread turned out great, it was a box mix. I am new to gluten free and am trying to acquire all the special ingredients I need to make my own bread without the box mix. I live in rural area so have to find out my best options. I only have one more ingredient to purchase to try my own loaf. That will be very soon. Thank you so much for responding, Kathy! I’ve thought of buying this,aching for several years but was hesitant to do so without knowing how GF breads work. Have you read the Artisan Bread in 5 minutes books? Their second book has a number of GF breads but I’ve made them by hand. Thanks so much for the helpful comment, Tabitha! Do you stop it 25 minutes early on ALL bread recipes? Also, is there anything else you’ve found you need to do differently for GF breads? My favorite recipe you have EVER posted are your bread machine butter rolls. They are so easy and every time a makes them someone asks me for the recipe! I can’t thank you enough for mine Crystal! I won it back on the summer for a giveaway you had. I love it and it’s my favorite way to whip up pizza dough. Funny. I was just pondering over the weekend what type of bread machine to purchase. I really want to start making my own, but don’t have time to knead it myself. Thank you everyone for sharing tips and advice as well! I have one like Crystal mentions. I bought it with 30% off coupon paired with kohls cash offer to get it at a better price. So worth the money. I have a Breadman bread machine that I got approximately 3 years ago. I love it! I use it to make all the recipes you post on here that require a bread machine or dough cycle. I have a Breadman Bread Machine also! I love it! I use it for lots of yummy sandwich and snack breads and to make pizza dough. I have a Oster bread machine. I use it mostly for dough, and bake it off in the oven. I got a Zoji in November. 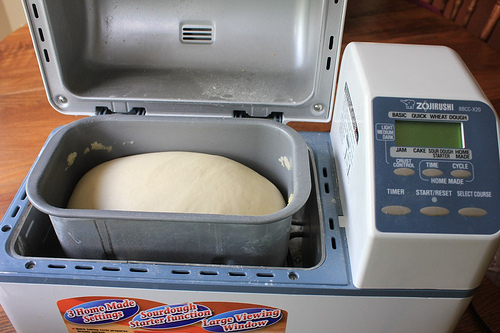 It is my third bread machine. The first two were West Bend machines which I wore out. The West Bend does make good bread and dough but I wanted a heavier duty machine for whole grains. I love the Zoji. It makes the best dough that I have ever worked with. I do bake in the machine. I use the quick wheat cycle and put the crust setting on light. The bread is done in only 2 hours and 18 minutes. I put the loaf in a closed plastic container when it is still just very slightly warm and the crust gets nice and soft by the time we eat it. I find that the dough needs to be much wetter in the Zoji than it did in my other machines. I make my pizza dough on the long dough cycle. I use the short dough cycle for dough for bagels. I can make a dozen bagels with only 20 minutes of hands on time and they are delicious. The Zoji did have a big learning curve for me. I found that there are some forums out there on using the Zoji and that made all the difference in trouble shooting why I was not making good bread at first. If I have to bake my bread in the oven then I don’t consider it a good machine for me and would just use my Kitchen Aid for the dough. Can you share the forum links? My bread machine is a Hitachi that’s a hand-me-down from my Grandma when she decided she needed to cut back on bread. It was a great improvement over the last hand-me-down which got to be so loud, you couldn’t be in the kitchen when it was running! I have never baked bread it in, I think it’s hard and coarse that way. And, like you, I love that I can have bread going in 10 minutes or less. As much as I use it, I would have a hard time doling out the money to replace it if I needed to. I’m sure I could manage to make bread without it if I HAD too. Hopefully I don’t have to make that decision for a long time! I found a nice bread machine at a thrift store recently for $7. I’m back to making all my favorite recipes. This is my 2nd machine. I posted about it at Home Ec @ Home. Panasonic bread bakery off craigslist 3 yrs ago for $20. I love it. Smaller than the zoji but it makes great bread and get used 5-10 times per week for my family of four. I do recommend buying flour and yeast in bulk at a warehouse club if you want savings. I don’t have one but I love to read the comments so I know what to look for when I can eventually afford one. I used to have an Emeril Lagasse bread machine but it died on me. Instead, I use a kitchen aid mixer which I have found to be the best for me personally. Before that, I was doing it by hand which wasn’t super difficult, just time consuming (especially if you’re making wheat bread)! I *had* an Oster that was about 30 years old. When it went out last month I asked for one on freecycle and I received one identical to my original one except it has a Sunbeam label. LOVE mine and use it almost daily!! I use the dough cycle and then bake various ways in the oven!! I have a Zoji also and love it. I have had several brands of bread machines all bought second hand at yard sales or Goodwill. This one Breadman brand one I have just keeps on ticking, I think it is going on at least 8 years of use now and I use it at least once a week and sometimes several times a week. My mom had a bread machine and I loved waking up to the smell of fresh bread. Probably the best smell of any and its so inviting. Her bread pulled apart and was probably the softest bread I have ever had. I had a friend give me a Breadman bread machine and its horrible. Nothing like my moms and what I grew up with so I am parting my ways with it. I hate the recipes it offers and it over-cooks leaving the bread dry and boring. Before trying the machine I purchased a Bosch and am going to stick with that as my bread maker and I will be the baker. I don’t like that the bread machine takes up extra space and only does so little. I prefer my home made rolls and bread anyway over what any bread machine can produce and the quantity. Because of all the recipes I was seeing here I bought a small machine at a garage sale for $5 a few years ago. It was working great for making dough but it was not big enough to hold Crystal’s cinnamon rolls recipe. One day I came across a zojirushi at a garage sale for… $2…!! Asked if it worked they said yes. It had barely been used and I love it! Love that makes dough in 45min versus 1:15 with the little one. My best garage sale find by far. Still kept the old one for when I want to make 2 pizza dough recipes at the same time. has amazing bread recipes. I have one just like yours -the Zoji- that I bought used on a buy/sell/trade page on Facebook. However, my bread keeps coming out lopsided- like one side rises (raises?) higher than the other. Any suggestions on what I may be doing wrong? You are doing nothing wrong, this can happen in the zoji with smaller loaves. The dough is just lumping to one side or the other before it rises so it comes out lopsided. Happens to me all the time. To try and prevent it from happening, spread the flour as evenly as possible over the liquids, or if you can, check the dough before the second rise and reposition as needed. Or just make the larger size loaves, they always rise beautifully. The paddles have to be in exactly the same starting position or you are more likely to get lopsided bread. I splurged on a Zo and love it. I use the recipe printed on the sticker they put on my machine. Every loaf has been perfect. Make sure that both of the paddles are facing the same direction before loading the machine. The Zo does have this problem but facing the paddles the same direction seems to make it less so. I’ve had a zo for many years and love it. I do bake bread in it and we are very happy with the results. Plus I make zucchini and pumpkin quick breads. It makes jam also. Great machine. I have a Zojirushi that my parents surprised me with this past Christmas. My daughter has developed a gluten intolerance and in passing I must have mentioned something to my Mom about getting a bread machine. A giant box showed up before Christmas that I was not allowed to open until Christmas morning. It has worked great for us. I bought mine several years ago (a Pillsbury, but the same as a Sunbeam) at a Goodwill while visiting my SIL in the Cincinnati area. I paid $10 for it and it has served me well. It is about on its last leg, so I will be keeping an eye out for a replacement soon. I would love one like Crystal’s but with only the two of us now, the cost would not be justified. The smell of fresh-baked bread has to be one of the most delicious on earth! We are empty nesters too and I just bought a Zoji in November. I figure it is still worth it for just us. With lighter use it may last us for as long as we can make our own bread. Lesser machines have a much shorter lifespan and I should have just spent the money when I bought my last West Bend. It only lasted 2 years. I have a $5 garage sale Sunbeam. It has worked great usually twice a week for a year and a half. It took me probably 6 months to perfect my recipe, but we love it. My husband always says he could never go back to store bought bread. I found an Oster at a garage sale a couple of years ago as my first and only machine. After the first couple of loaves I found that it cooks better in the oven. Since then I’ve only baked it in the oven. As I’ve had time, I’ve realized that it doesn’t knead as good as it should and wondered about the dual paddles. I’ll have to keep my eyes open for a dual paddle. I looked up your bread recipe that you posted back in 2008 and noticed you milled your own flour. At that time you were buying from Whole foods for .59 per pound. I am interested in milling my own flour, and I was wondering do you still purchase from Whole Foods or where does one find the best deal on wheat berries now? I can only imagine that the cost is substantially higher now! :). It’s actually still similar in price if you purchase it in bulk from a local co-op or Azure Standard. Thank you! Good to know. I’ve heard of Azure Standard. I will look up more details about them or see if any of my local friends know of a co-op nearby. If you live near an Amish or Mennonite community, they often have bulk stores where wheat berries and other baking items are available in bulk–usually cheaper than Costco/Sam’s etc. Another source, if you live in PA or VA, is Sharp Shopper. Frankferd Farms is a co-op in PA that has regular routes to many surrounding states. Finally, many places on the east coast are served by the Bread Becker’s out of GA.
My mom swears by Panasonic. You can pick them up for a good price and good condition at Goodwill. My mom always reminds me to look for one. My dad bought me this bread machine last year for Christmas, and I have been loving it! I use your favorite bread recipe, and your recipe for cinnamon rolls a lot(although probably not nearly enough, in my kids opinions!) Thanks for the recommendation! I love my Hamilton Beach bread machine that I bought for a great price from Walmart. I have a Kenmore that can make a 2lb or a 2.5lb loaf of bread, and it works beautifully. I actually bought it on Craigslist for a little bit more than I wanted to pay ($40), but after having it a year, I’m sure that it has been worth it, as the many settings that it has have all come in handy. I don’t use a bread machine anymore. I use the Artisan Bread in 5 Minutes technique and it has revolutionized my bread-baking life! You mix up a batch of dough with no kneading. Just mix, let rise for 2 hours and refrigerate. Each batch gives you dough for 4 1 lb. loaves. On baking day, take out a grapefruit-sized chunk, throw some flour on it, shape it and let rise for about 90 minutes. Bake for about 30 minutes. The loaves are incredible! Great crust with that artisan look that costs $4-$5 in stores. Try your library for a copy first before buying. There is also a Healthy Bread in 5 that gives recipes for using healthier grains. Additionally, there is a website with support, updates and lots of information, new recipes. I have no commercial interest in this. I, too, love the Artisan Bread technique and make dough weekly this way. I think it works great for crusty loaves, focaccia, and pizza. I also use a bread machine since I like to make hamburger buns, cinnamon rolls, and other kinds of soft, egg & milk enriched, dough. I have recently been making the bread-in-five artisan bread. The recipe can be found online; though I found it on the back of my gold metal flour bag. You don’t have to buy the book to try it, if that helps anyone! I admit all I’ve done so far is the basic white flour recipe, but I plan to try whole grain versions. I’ve never had a bread machine (well, I was given one as a wedding gift, but we had nowhere to put it, so it sat on the floor till I got rid of it). I always heard that whole wheat breads didn’t work in them, so I didn’t want one. Maybe I’m wrong? I have a Breadman and it gets used weekly. Love it! We use it mostly for the dough or pasta cycle. It also has a handy quick bread and 59 minute cycle if you need bread in a hurry. It’s about 8 years old. Bought it new off of Ebay. I have a zoji and it is my 3rd bread machine. I personally cannot stand baked-in-machine bread, so bread machines are always “dough makers” for me. It’s honestly worth it to me for the time savings and the fact that my kitchen is always to cold for bread to rise. However, I don’t think the zoji is any better at making dough than my previous two thrift store bread machines. The real test will be if this machine lasts longer than my previous ones, which only lasted about 2 years each. Who knows how much use they had before I got them used. I have a Cuisinart Bread Maker, but I prefer to use my Kitchen Aid Stand Mixer with the Dough Hook when making bread and pizza dough. It’s quicker than using the dough setting on the bread maker, but I didn’t discover this until after I had already bought my bread maker. I could never justify the purchase of a bread machine I don’t want to take up space in my small kitchen. I find baking bread from scratch really easy – especially with the dough hook on my kitchen aid mixer. Many people have found them at thrift stores or garage sales, but I totally get the fact that they are a bit bulky. A KitchenAid mixer is a great alternative! To all of you breadmakers, how long does the bread last? I spend about $7.00 a week on two loaves of gluten free bread for my son and I was wondering if it is worth it to purchase a breadmaker and make bread from scratch. If you don’t freeze it, it will usually stay fresh for around 5-7 days if properly sealed. If you freeze it, it will usually be good for 4-6 weeks. I love using a bread machine! I have a Welbilt model called the Bread Machine. I have had it for 14 yrs I just realized. I bake in it occasionally but mainly use the dough cycle. I saves my arms and shoulders, I have Fibromyalgia and it was hurting me to do the kneading. I have been looking for bread machine recipes like these. Thank You! God bless! I have a Zojirushi Bread Machine as well. I love it! I use it for dough and to make the bread. Awesome machine. It’s the only brand I would consider! I had a discontinued West Bend that after reading all the reviews I purchased for about $60 on Ebay. It makes a regular size loaf shaped like a loaf of bread from the store. I loved it, but it took up a lot of space. I gave it to my sister. I have a Breadman that I love which came from a thrift store. It was new in the box. I used to get both machines going at one time. I did all my baking in one day for the week. That was the nice thing about having two. Thanks for posting this! I am in the market for a bread machine because we will be moving overseas and I would love to be able to make some homemade (home style!) bread. I will definitely be checking these out! My mom has a Zoji and swears by it. My husband was diagnosed as highly gluten intolerant a couple of years ago, and I got rid of my bread machine. He really dislikes the taste and the heavy, thick, texture of the gluten free bread in the stores, and has really missed his bread. I hadn’t thought of making gluten free bread in the bread machine. Thanks for the idea! I have the very bread machine that Crystal has and LOVE IT. I wouldn’t want any other kind. I have a Black & Decker and love it. Haven’t used it for a long time but recently started again. I usually bake multigrain bread and they turn out perfect every time. Good feature too is the timer, so I can put ingredients in at night, set the timer and have fresh bread for breakfast. I made pizza dough last week and there is basically no work involved. Very easy. My husband is a diagnosed celiac. He misses his white, soft bread for a tomato sandwich in the summer. We don’t care for the bought Gluten Free bread or the bread box mixes. I have a Breadman machine. If anyone has a good white bread recipe that you like, would you please share your recipe with me? I will be glad to send you my email or you can PM me. Thanks so much. Love all your helpful bread making comments!!!! I am needing a Gluten Free white bread recipe in case I wasn’t clear in my above post. Thanks again!! We have a zoji too, and we loved it for awhile.. But the bread is always so dense! Does anyone have a great recipe (white/wheat) that doesn’t get dense and heavy? We went back to store bought bread because it’s so much lighter! Much prefer that texture. I had a bread machine several years ago but decided that if I was truly on a money saving quest- and if I were really being honest- then it just wasn’t for me. I can bake 6 loaves of bread at once in my oven. We can eat fresh and freeze the rest if we have to but usually we can just refrigerate and it is fine. For me- with electricity rates what they are out here- We save much more money by doing it this way. I started making bread by hand 28 years ago. Then 20 years ago, we had a pot with a dough hook. Then 13 years ago we got a Kitchen aid. It worked for a long time, but I accidentally dumped too much flour in and it jumped a gear. My son has it and fixed it. A few years ago, friend gave me a Bosch mixer and that helps me make six loaves at a time for the seven people we have at home. If the bread is ready at meal time, we eat at least two loaves right away. From the time I decide to make bread, until it goes in the oven is 15 minutes. That includes milling my flour! I have never had or used a bread machine, but if I did, from what I have read here, I would want a Zojirushi. Thank you for sharing! I’m just the opposite. I’ve used bread machines off and on but after the last one died I gave up on them for good. I have my mom’s KitchenAide mixer which is still kicking after almost 20 years. Making bread without a machine does not take that long (the rising is the largest time eater, even with a bread machine.) and there is something so therapeutic about kneading the dough and getting your hands in there. Mmmm…now I want to go whip up a batch of my honey wheat bread! Try JulesGlutenFree.com. She has multiple gluten free recipes. She also sells a gluten free flour that is great along with mixes for bread, cookies etc. The flour can be substituted in any recipe that uses regular flour. You can also read how she came about developing the flour. I have an older one (cant remember the model or maker right now) that I hardly use. (It was given to me) But now my Aunt wants to use it but we need to find Gluten Free recipes and I haven’t had much luck. I do know the main difference is that with gluten free it only needs to raise once. Do you know of any or maybe websites that I might try? I have the same bread maker, and I LOVE it. I could not live without it. I use it for dough (pizza, dinner rolls, hamburger rolls, cinnamon swirl bread dough, etc.) and also for baking bread. I ALWAYS use King Arthur Flour with it, and it makes the most heavenly, well, everything! I use the 1.5 lb recipe that came in the instruction booklet for bread, the pizza dough recipe that came with it for pizza (with King Arthur Flour pizza dough flavoring added which is cheese and other yummy stuff), the KAF white dinner roll recipe, KAF PJ’s Cinnamon swirl bread, KAF Beautiful Burger Buns, KAF Cinnamon Buns…well, basically anything from KAF. Which is also where I got “Zoey” from (as I call her). I can’t say enough good things about this bread maker, and paired with KAF products and recipes, you will be the talk of the neighborhood! The 2 paddle Zoji is definitely the best machine and is the one we have. The 2 paddle Panasonic was ranked second best in all review sites when I was shopping for one, but I was concerned about the quality of the non-stick surface. Zoji seemed to have a more solid pan and non-stick surface that will last. Love mine too! Have you ever made meatloaf in it? It’s the best (recipe can be found in recipe book that comes with machine). You can also make an awesome Mexican meatloaf in it. I have THREE old, old,old West Bend Traditional loaf bread makers. One we received as a gift early in our marriage more than 20 years ago. The other two were thrift store finds. They are THE BEST! Similar style to the one in described in this blog with two little dough paddles in a “traditional” loaf pan. I didn’t know what I would ever do if these little workhorses go ca-put, but now I am happy to see there is a possible replacement for mine if the need arises! This post has inspired me to dust off my old bread machine and give it another shot. When I do eat bread, I only eat whole grain bread (and usually sprouted which I have no idea how to make myself) so I will have to experiment with flours such as a mix of maybe whole wheat and spelt flour or maybe spelt flour and almond flour. I am going to experiment with your sister’s bread recipe because it uses coconut oil (normally we eat no “oil” in my house) and has no dairy in it. Thanks for the post. This will be on my to-do list for next week. The best prices I’ve found are by buying in bulk from a local co-op or from Azure Standard. My bread machine is a talking Pillsbury Bread Machine from back when bread machines were first introduced. It is still going strong and is one of my favorite appliances after my Kitchenaid mixer. I actually won it for selling the most toys for a toy party. I once had fudge made in a bread machine. I have never been able to find the recipe. I love mine too. I usually mix the dough in it and then take it out and put it in a regular loaf pan. I have another machine, but could not produce a decent loaf of bread so it was gathering dust in my basement. I inherited this same machine from my brother in law who passed away last year. I gave it a try and since then have not bought a loaf of bread from the grocers. I love it though sometimes the loaves are mishapen and do not rise at one end. Did you ever have this problem? the bread tastes fine but is very dense. what do u use to slice your bread? would like to make the switch to making my own sandwich bread, but don’t know how to slice sandwich slices. I had never even considered a bread machine before reading this article for the first time last year. My mom surprised me with a bread machine for Christmas and I’m hooked. My favorite recipe is the cinnamon bun recipe you shared. I always freeze half, but it still only last a few days! I’m looking for buying a bread machine and want to buy what works really good without spending a lot of money. Have been looking on craigslist. I have been using two bread machines and trying to alter the ingred., but then it comes up over the top and makes a mess to clean up!! Let me know your favorite bread machine and why.